4 Configuring other interface like "eth1"
Many situations occur when a static IP address needs to be set. For example, if you have programs that use the IP address say for remote login, then you might hardcode the IP address. But if the IP address is dynamic it can change, and thus you need an IP that does not change and hence you would need to set a static IP for your system. 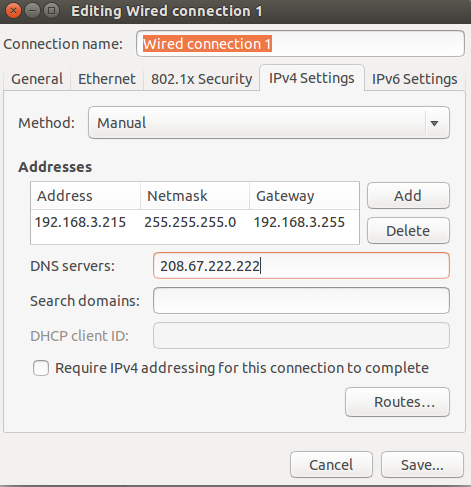 This tutorial deals with setting a static IP for Ubuntu OS. Below is a screenshot of my "interfaces" file. 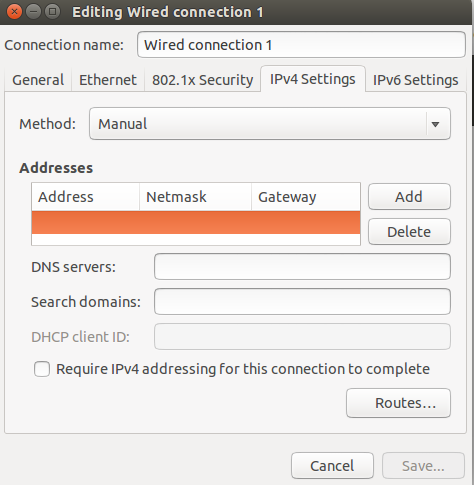 Note that Bcast also means Gateway, and mask also means netmask. Here we assume that our new static IP to set is 192.168.3.215. So please make changes according to your "interfaces" file. Save and close it. This confirms that the changes have been applied. So, this way changes can be made to many different interfaces. 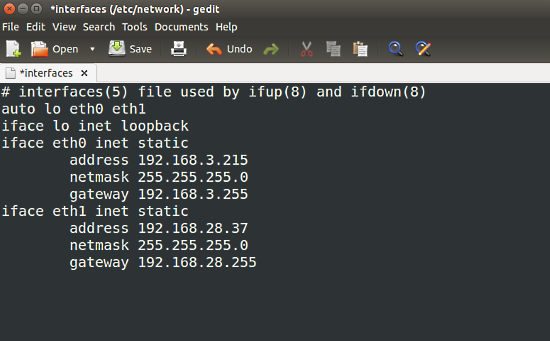 Here we have set one IP address for "eth0". But, what if we want to set another IP? 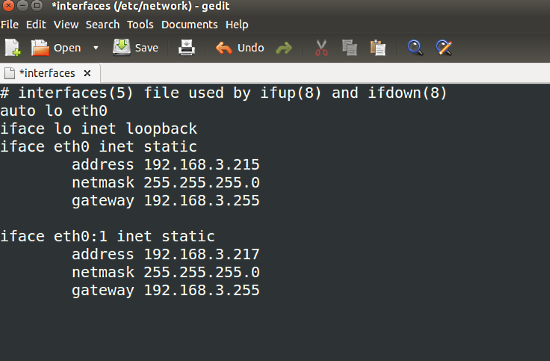 Here we have set the IP as 192.168.3.215. Now for the same interface if we want to set another IP say 192.168.3.217, then we can do it by changing the "interfaces" file. Here "eth0:1" indicates that we are assigning a second IP for the "eth0" interface.The changes are represented in the image below. Most of the configuration done above can be carried out in the desktop application called "network". 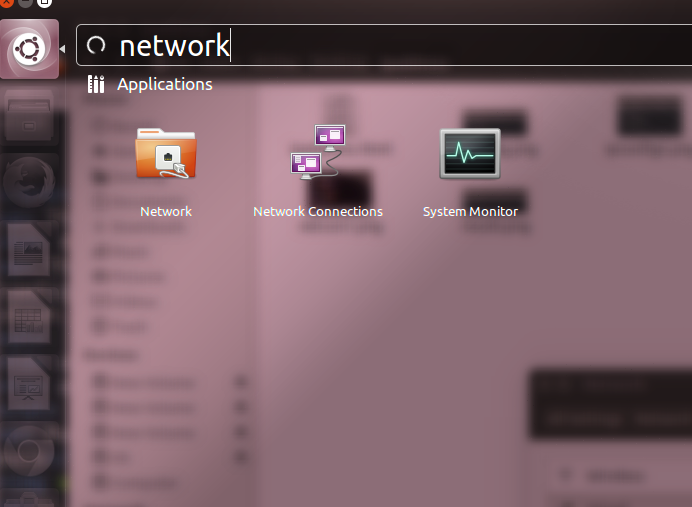 To go ahead with that, start by opening the "network" application from the dash as shown in the image below. Once saved, we will have to restart the system as before in order for the changes to be applied. Now we can change the IP of an interface to static when we need to. We can have multiple static IP addresses for the same interface and multiple IPs of different interfaces. There can also be a mixture of static and dynamic IPs for different interfaces. It is also possible to change the IP using a desktop application. Please remember to take a screenshot or make a note of the initial IP config, which you might need, when you wish to go back to the initial settings. Also remember that giving IPs same as the ones already existing on the same network can lead to IP conflicts and might lead to network failure too. 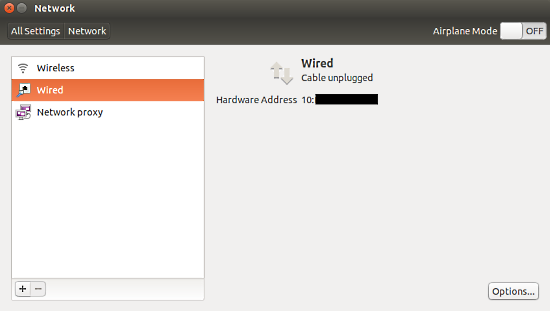 So "network 192.168.1.0" no longer needs to be specified in the interfaces config? I think I've always done that for some stupid reason (bad habit?). Sorry but this is a bad howto.. If you edit manualy, make sure you remove the resolvonf package. second, remove the "network manager" package. if you dont do this, it will messup your config. als no /etc/hosts check,, if you switch from dhcp to static, you also must change the /etc/hosts to match your hostname and ip. network connection is managed by nm-connection-editor. /etc/network/interfaces is not used anymore. I want a static IP when I'm on my home-office/small-office network, but I need a dynamic IP when I'm walk-about with my laptop. I wish there was some way to automatically process: IF SSID="string" THEN run("script"). This script could then do whatever based on where I'm connected. The correct way to set DNS is NOT to modify /etc/resolv.conf that is also a link, so you broke things. thanks. the graphic interface worked for me . 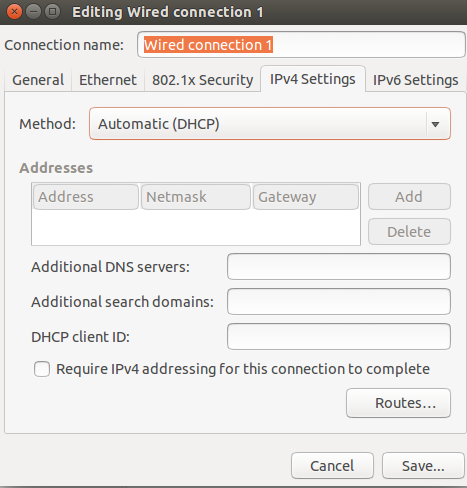 I am trying to assign Public Ip address to mu Ubuntu PC. 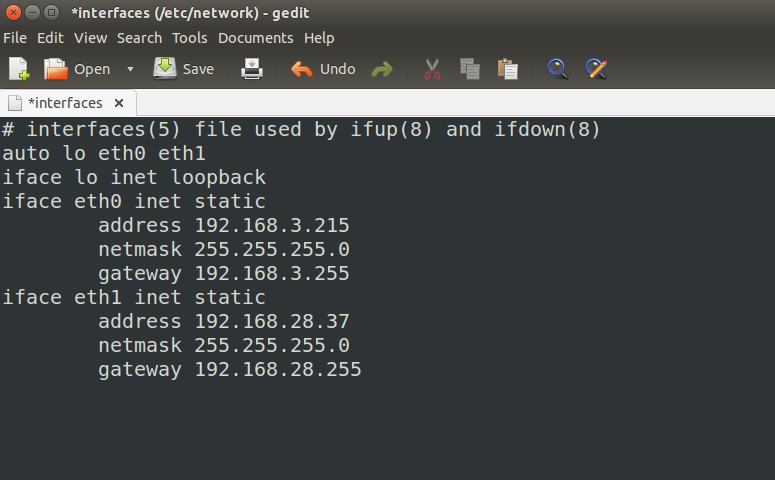 I already got connection from Public IP router. I am trying to assign Ip address: 199.33.115.224, subnet: 255.255.255.192, gateway: 199.33.115.193. But when i assigned the Address to network. It's show me the unmanaged network. SO, its not connected to network properly. Please, provide me a proper direction to assign public Ip address to my pc. Why should we configure another IP for same interface ? Will it be helpful in case of ipadress conflict e.g. say I switched on my laptop and there is some other network connected device like mobile which has already aquired ip which I has mentioned as static IP for my laptop. Please guide and sorry for being novice in networking concepts . 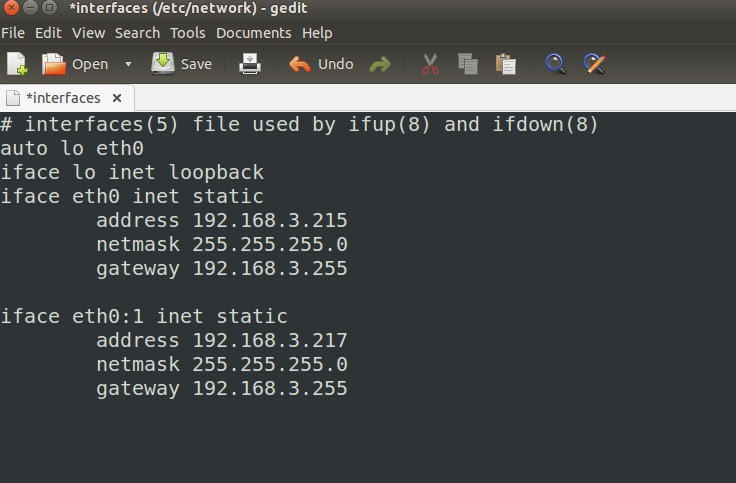 Additional IP addresses are e.g. used for servers when you want to assign a dedicated Ip to a specific service or website or when you run multiple virtual machines on your computer where each virtual machine is connected to a different external IP.